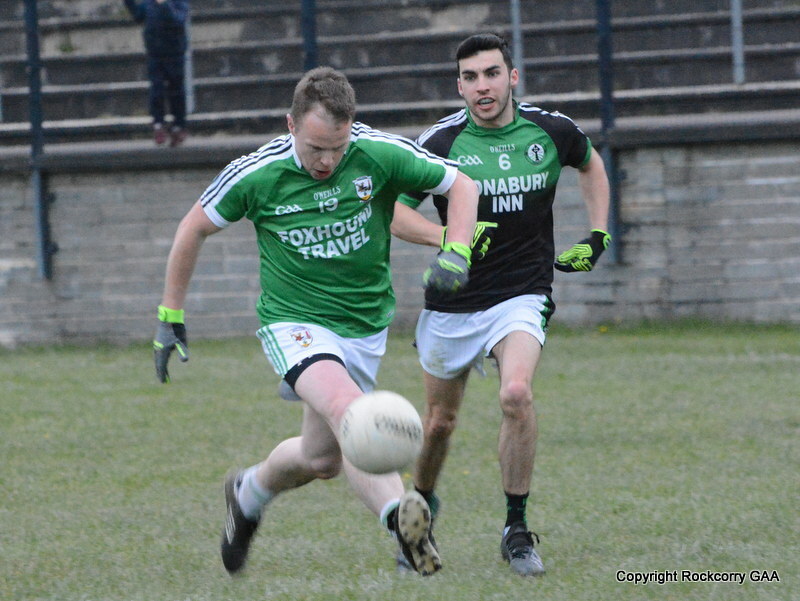 The latest instalment of the football rivalry between Rockcorry and Latton took place on Sunday 5th May when both clubs went head to head in the Drumlin Credit Union senior football league. It was our first official home match in the senior league campaign and unfortunately it wasn’t a spectacle to savour, but that hardly bothered Latton! 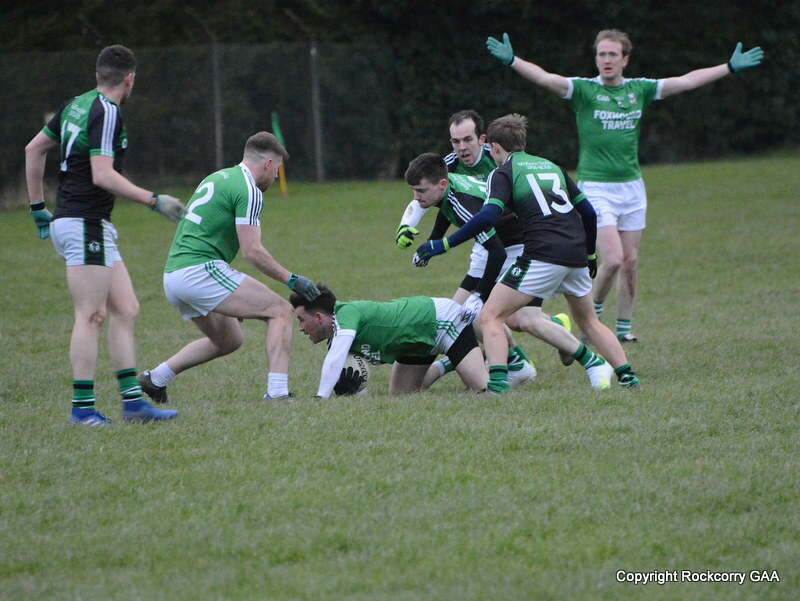 As the score-line suggests this was a comfortable victory for the O’Rahilly’s side who from an early stage controlled the game and played some sweet attacking football to secure the spoils with a clean cut victory on a final score-line Rockcorry 2-9 Latton 3-17. On a day when a strong swirling wind made scoring hard we found it extremely difficult to put scores on the board whereas Latton on the other hand were much more clinical with every attack and a terrific display of point taking saw them cruise to an easy win. Latton were chomping at the bit from the very start, enjoying the Lion’s share of possession, and dominated the opening exchanges with their first score arriving after forty-nine seconds courtesy of a free-kick by Hugh McElroy. They doubled their lead shortly afterwards with a superb long range score from Bernard O’Brien and their blistering scoring spree continued as they applied all the pressure and when Garry Calvert was adjudged to have fouled his opponent, on the 5th minute, Hugh McElroy duly tapped the resultant free-kick over the bar to open up a three point cushion. Martin Carroll, who was introduced for the injured Garry Calvert, spurned a good scoring opportunity on the 7th minute and moments later Fergal McGeough also kicked wide before, Latton’s sharp-shooter, Hugh McElroy converted another free-kick. 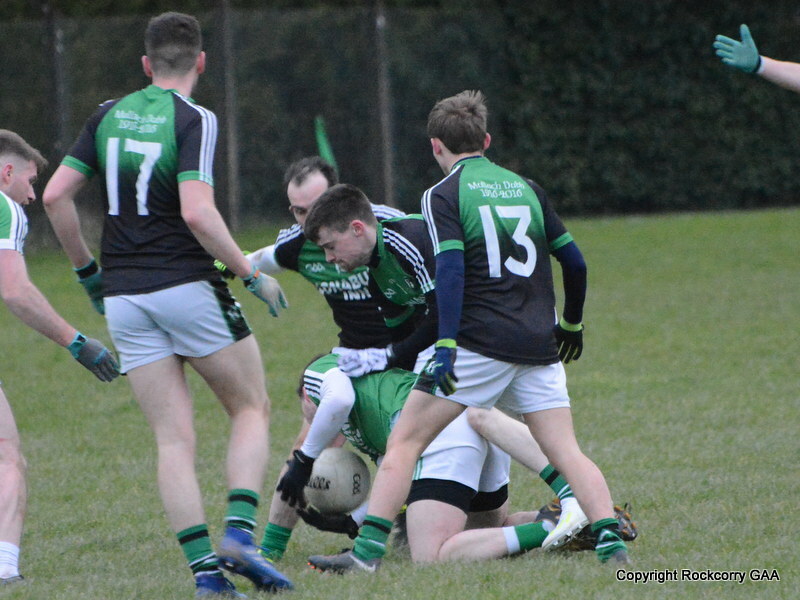 It wasn’t long before four points became five with Shane Coyle scoring a fine point and then Monaghan county star Owen Duffy showed his prowess and glided over a monstrous long range point to stretch their advantage, leading 0-0 to 0-6. We opened our account on the 15th minute when Keelan Clerkin did extremely well to direct a lovely measured pass into Fergal McGeough and the corner forward finished in style. To compound our misery, Latton, who were without the services of Monaghan star midfielder Eoin Lennon due to a groin injury, stretched their lead with three answered points to lead by 0-1 to 0-9 after twenty minutes. We tried to respond and Mark Daly added a point on the 22nd minute following good approach play by Lorcan Smyth but this was quickly cancelled out when a swift move down the field on the 25th minute yielded Latton’s first goal when Hugh McElroy accurately placed the ball past our goal-keeper, Dean Fay and they landed another point shortly after to go eleven points clear (0-2 to 1-10) as the game, at this early stage, began to slip away from us. Mark Daly reduced the deficit on the 27th minute following good work by Johnny Reilly and when Noel Carroll penetrated the Latton rear-guard his attempt at the target was well saved by the Latton goal-keeper and pushed around the upright for a forty-five, which sadly led to nothing. 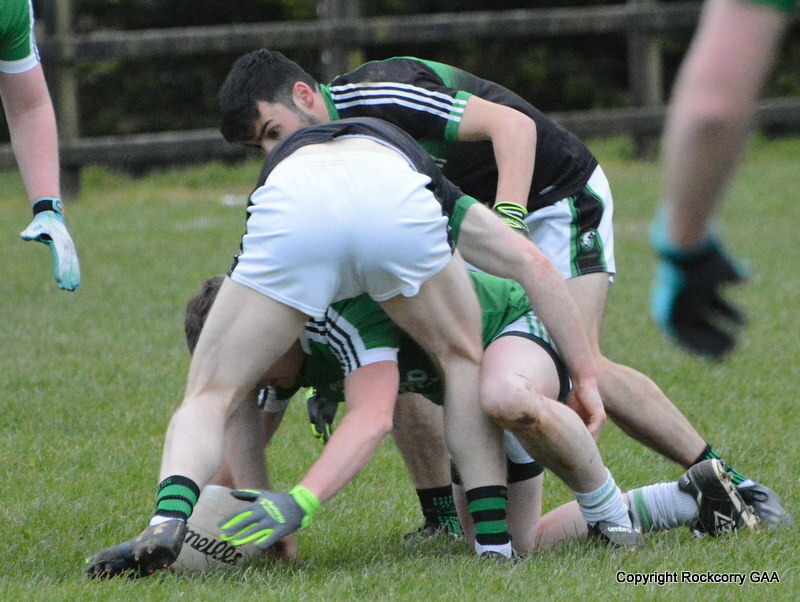 With half-time approaching Mark McGuirk was unlucky to see his effort go narrowly wide but Keelan Clerkin completed the scoring of the first half with a delightful lob over the bar after good work by Noel Carroll and Paul McKeown to leave the scoreboard showing Rockcorry 0-4 Latton 1-10 at the interval. 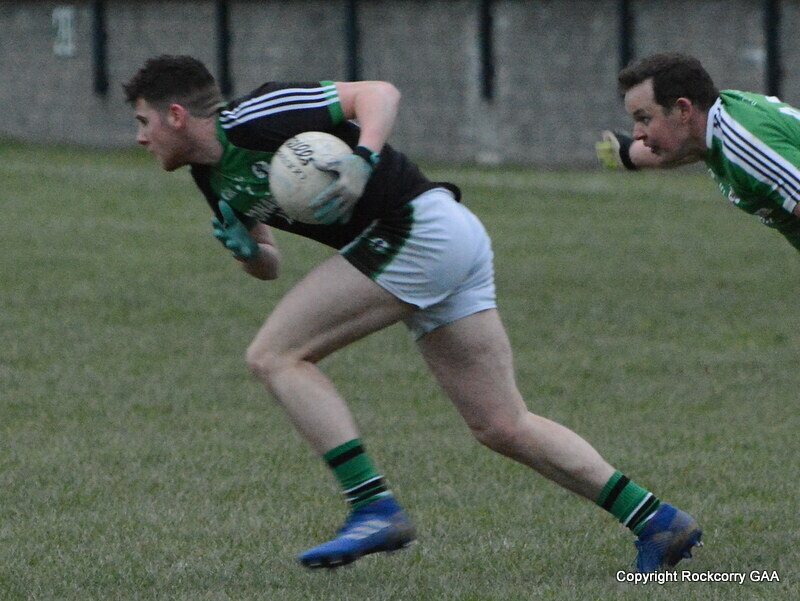 We started the second half much the brighter and just twenty seconds had elapsed before Noel Carroll soloed through the opposing defence and finished with a superb point and Fergal McGeough pulled another point back when he shot over shortly afterwards. However, our comeback was short lived as Latton rapidly replied with a fine score on the 2nd minute and within thirty seconds Hugh McElroy rattled the net for the second time to give them an unassailable advantage, leading 0-6 to 2-11. At this stage we needed a goal to ignite any sort of revival and while an attempt by Paul McKeown, on the 5th minute, drifted wide of the uprights Dwayne Rooney scored a fine goal on the 7th minute and Noel Carroll tacked on a point to give us a glimmer of hope! Unfortunately, we were unable to make much headway as Latton added two more points to lead 1-7 to 2-13 after fifteen minutes and as the game entered its final quarter our team captain, Keith Daly, had to retire from the game injured with a suspected hamstring injury and was replaced by Jamie Smith who instantly made an impact with a mighty point from play. The next five minutes of the game we struggled to compete with our opponents, on a number of occasions, and quite frankly was a non-contest. Latton were totally dominate as they turned in a power packed performance and notched up an impressive 1-4 without reply to open up a fifteen point margin, leading 1-8 to 3-17, after twenty-two minutes. Noel Carroll reduced the leeway, on the 30th minute, when his unstoppable shot, from a twenty metre free-kick, crashed off the crossbar and found its way through a crowed a goal mouth to hit the back of the net and a minute later he attempted to repeat the dose but this time his effort was deflected over the bar for a point to leave the final score Rockcorry 2-9 Latton 3-17.